Spring in the north is a time of melting snow and running water. It’s the best time of year for people who study underground water flows. Those underground rivers are important, especially where surface water easily drains into bedrock. It can quickly carry pollution long distances. Hydrologists try to map these underground rivers to help protect fragile ecosystems. As Stephanie Hemphill reports, the first step in making these maps is a process called dye tracing. 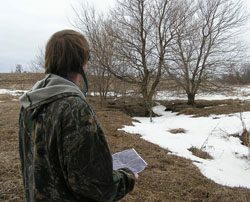 When the snow is melting in the woods and fields, Jeff Green wants to know where it’s going. Green is a hydrologist with the Minnesota Department of Natural Resources, and an expert in the limestone geology of Southeast Minnesota. Green climbs a fence and splashes through a stream that’s flooding a pasture. 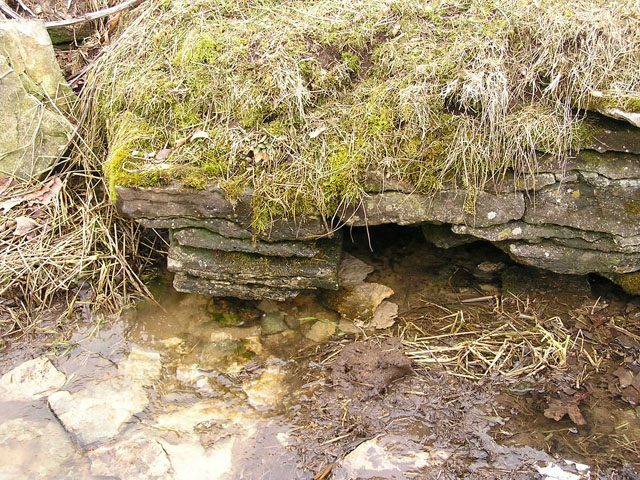 The stream is bordered by a natural wall of limestone. Melting snow seeps into the limestone. It runs down vertical cracks to bigger horizontal openings that look like miniature caves. Jeff Green calls these “conduits,” and some are three inches wide. Green has traipsed out to this pasture to put what he calls a “bug” in a spring. The ‘bug’ is a small mesh bag about the size of a cellphone, packed with charcoal. The charcoal will capture a dye that he’ll pour into melting snow in a sinkhole a few miles away. He’ll do this in several different spots. By tracing the paths of different colors of dye, he’ll learn the sources of the water that feeds each spring. That will help him make what he calls a springshed map. We slog across a corn field that’s dotted with small groves of trees. They’re growing around miniature canyons, about 20 feet deep. Here, you can see how this honeycombed water highway works, and this is where Jeff Green will pour the first dye. Green climbs down carefully into the crevasse. He’s found some running water. He pours a cup or so of a bright red fluorescent dye into the snow. Green marks the spot with a GPS unit. This is a place where surface water and groundwater meet. That means what happens here on the land directly affects the quality of the groundwater. There are wonderful trout streams around here. The map Green is making will help protect those streams by pinpointing the source of the water that feeds them. In a day or two, Green will check the “bugs” he put in the springs, and find out exactly where the dye from this sinkhole went. He usually finds water traveling one-to-three miles underground before it surfaces. When the springshed map is finished, he’ll share it with local governments, farmers, and people who want to protect the water in this landscape.